This is a detailed breakdown of the traffic and income I was able to generate with Magnet4Blogging in the first year. Hey everyone, Fabrizio here and I hope you’ve all had an amazing Easter break – If you celebrate it, of course. I honestly can’t believe that we’re halfway through the month of April already, it feels as if Christmas was just around the corner. Of course, if you’re reading this post way into the future, maybe like 2019 or 2022, then what does it matter what time of the year it is? So that I could look back someday to see where and how it all began with my blogging business. To inspire and motivate anyone reading this to keep chugging along with their blogging goals. Just over a month ago (March 2015) I decided to take a break from blogging to spend some much-needed time away with my family. I really needed to do that because I could feel myself slowly burning out, again. Anyhow, I’m happy to be back feeling rather refreshed, and motivated to continue on my blogging venture. This past week, I’ve been going all-out sorting my email inbox, which had piled up something crazy, like 14,000 emails. I have several email accounts, by the way, one for each business that I have. Amazing things to have happened in March! Two awesome things happened during the month of March; My little girl, Lily Van Marciano, celebrated her 2nd birthday, and I couldn’t be more proud of the little lady. The other awesome thing that happened was this blog celebrated its 1st birthday, which I believe was on the 23rd of March! I say it’s the first birthday but I actually purchased this domain in 2013, but I didn’t really do anything with it until March of 2014. The last 12 months have been a real blast, I can tell you. Of course, there have been ups and downs as was expected, but I couldn’t be happier with the progress I’ve been able to make in such a short time. Of course, I have you to thank YOU for much of my progress. Without my readers, subscribers, and friends, none of what I have achieved would have been possible so thank you! It’s so easy to be over-critical about your progress, I think, and until you actually sit down and evaluate the things you’ve been able to achieve properly, then you should never beat yourself up or feel as if you’re not doing enough. Unless, of course, you really are not doing enough. You know, after I somewhat failed with my first blog (Magnet4Marketing), I took a 3-month break from blogging entirely (January 2014). If you’ve been following my online journey from the very beginning (2010), you may already know this. During my break, I thought long and hard about what path I would take next, and I actually considered the idea that blogging or online business just wasn’t for me. Yep, I considered that it was time to give up. I mean, I gave it the best shot and dedicated three whole years of my life to blogging, right? So, why did I just not quit? Well, it wasn’t until I reached out to a few of my blogging friends that I realized just how much I loved blogging and enjoyed the freedom of building an online business. I spoke to my wife Samantha (Girlfriend at the time), and she reminded me that I was in the perfect position to start over, especially now that I knew what I needed to do, and that I was a little bit more knowledgable. 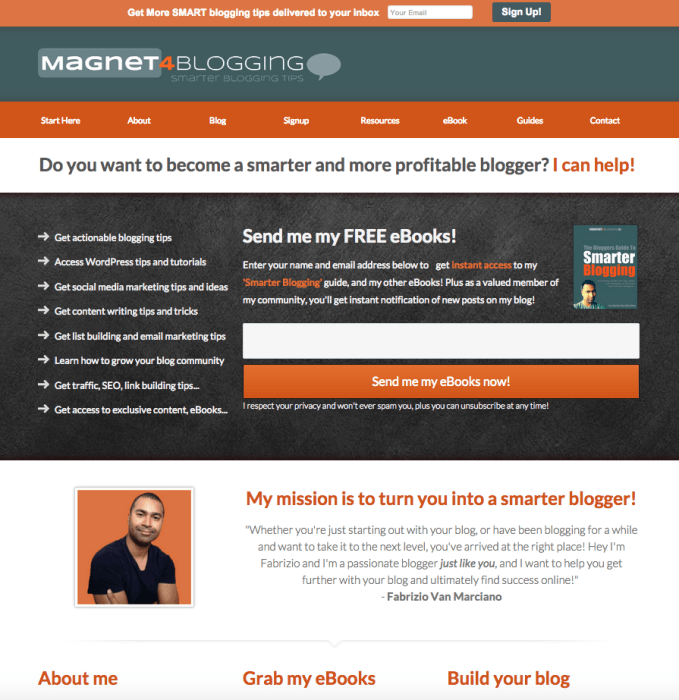 So, instead of ending my blogging journey in 2013, I decided to give it another go and launched Magnet4Blogging properly in 2014. Like I said, back in 2013, I purchased the domain name Magnet4Blogging.net. 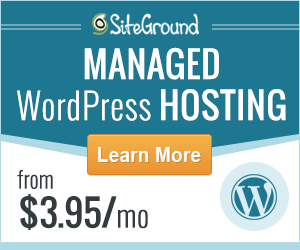 I had no intention of using it, I only purchased the domain name to simply create a WordPress and web hosting installation tutorial at the time. But, on March 24th, 2014, I made the whole-hearted decision to get back into blogging and start writing again. 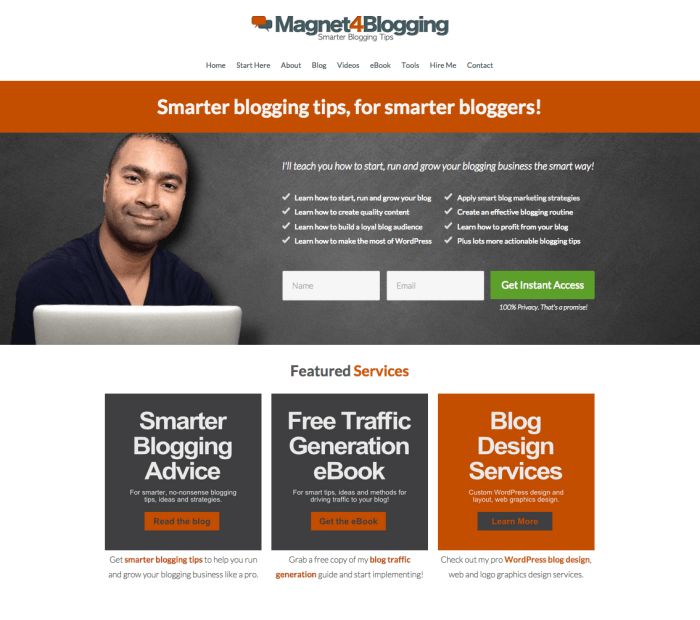 I decided to use the Magnet4Blogging domain and the first post I wrote for this blog is titled Starting Over After Google Penguin Destroyed My First Blog. You can read it when you get some time if you like. So let me start with what my blogging goals were for Magnet4Blogging in the first year. Creating lots of useful content. The content creation part was my main focus, I really wanted to put out some BIG, powerful, and useful pillar articles on my blog. I made some silly mistakes with my SEO and backlink building strategy in the past, I wasn’t going to do the same this time around. I decided to leave building links well alone, and as of updating this post in January 2019, I can tell you that I’ve not once purposely gone out of my way to build any backlinks to my website. Five years on, and my link building strategy is as simple as building zero backlinks. That’s not to say I’ve not gained any backlinks over the years, because I have, and here’s how. OK, so before I dive into this blog’s first annual traffic and income report, let me first share with you some statistics for the blog and social media channels. Keep in mind that most of the Twitter followers and Facebook fans I took with me from my previous blog at Magnet4Marketing. Asides from creating better quality content and promoting it correctly, here are some of the other things I’ve been able to achieve with Magnet4Blogging, so far. Set up email subscription funnel with Thrive Leads and MailChimp. Read this post. Launch a new web design service on the blog. Read more here. 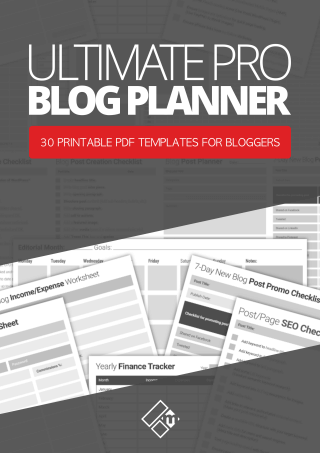 Launched my new “Blog Planner Workbook“. Get it here. Connect with many new readers, bloggers, and entrepreneurs. 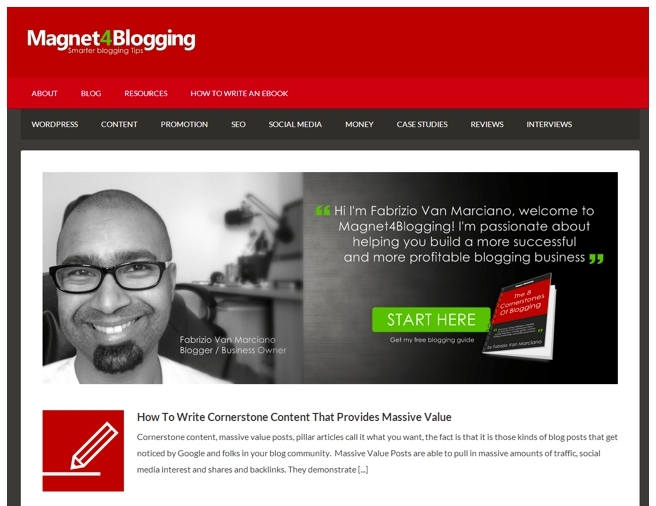 Blogging is like any other kind of online business venture, some things need to be adjusted. I think the most notable change I’ve made as a blogger has to be my posting frequency. When I was running Magnet4Marketing, I was writing and publishing content every single day, or every other day on occasions. Sometimes, though, I would write two posts per day. Over the last 12 months, I’ve only been writing a few posts per week, sometimes three posts but no more than that. Why this change in frequency? Well, once again, because I really wanted to focus on producing better quality and valuable content, and the only way I could do that was if I spent more time crafting each post properly. Also, I learned that blogging isn’t just about creating great content. It is also about getting that content noticed, by doing marketing and promotion. Actually, creating content was just the first small piece of a larger picture. In the first 12 months of building my blogging business, I went through a Crisis of constantly changing the appearance of my site. The screen shot above shows what the front page looked like in the first few months. In comparison to what it looks like today in 2019, it’s a bit of a change, wouldn’t you agree? I should also mention that I was also very unsure about the direction I wanted to take this blog in the future. At the time, I knew I wanted to provide a range of services, but I didn’t realize what any of those services would be until much later on. The theme I was using in 2014 was called Outreach Pro theme by StudioPress, you may still be able to find that theme here, actually. In June of 2014, I decided to go back to the drawing board and completely rebrand and redesign my blog. It was also the time I decided to start using a dedicated static homepage instead of just displaying blog posts on the front page. The theme I was using was still the same old Outreach Pro theme. In January of 2015, I decided to redesign the front page completely. Providing blogging and digital marketing advice was still a passion of mine, but I was still unsure about the services I wanted to provide and the new direction I wanted to take my blogging business into. To create a dedicated homepage for my blog, I used a plugin called Thrive Content Builder, now superseded by a plugin called Thrive Architect. 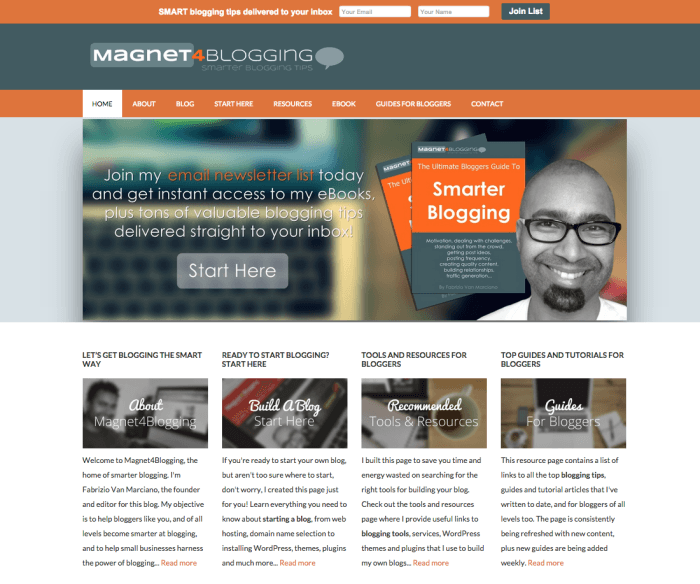 In late May of 2015, I made a few more tweaks to the homepage design, including creating a brand new logo for Magnet4Blogging. 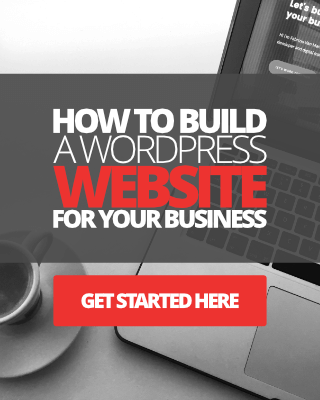 At this stage of my blogging business venture, I was also discovering and learning about many new WordPress website development tools. It’s ridiculous, I know. But the truth is, I was never really happy with any of the branding, style, or design I came up with and felt that I needed to chop and change things frequently. 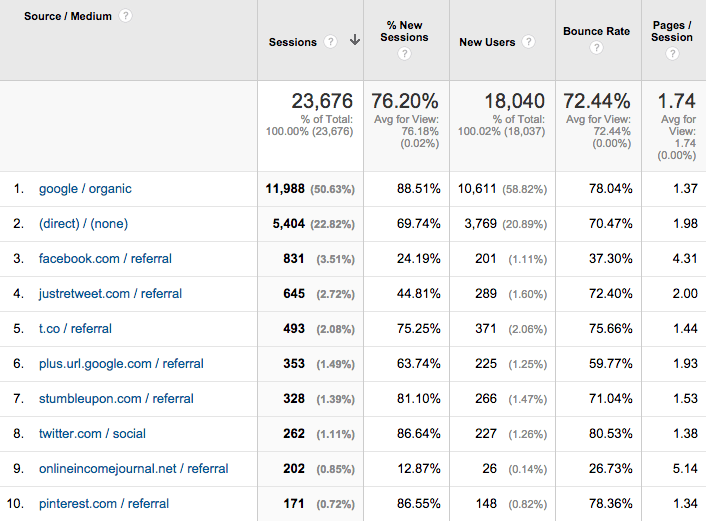 OK, so we finally, finally, get to the traffic stats for the first year of my blogging business. Once again, I’ll remind you that I’m sharing with you just the traffic, income and stats for this blog only. From the very start, traffic has been steadily increasing. The traffic took a bit of a nose dive over the Christmas holidays, as expected, but it slowly climbed back up again over the last three months as you will see in the screenshot below. I did sweat a little bit when Google Penguin update 3.0 was rolled out late last year (November 2014), I must admit. I didn’t really know what to expect, especially having experienced first hand how an algorithm update can quickly change everything overnight. But, as it turned out, traffic increased ever so slightly a few weeks after the update, I was happy about that. 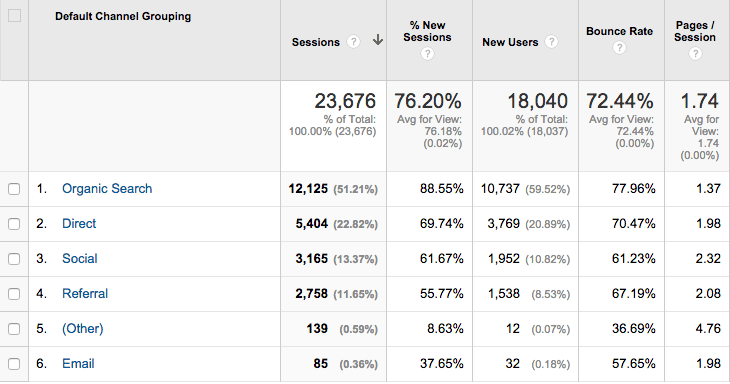 Here’s a quick overview of the traffic stats for the first 12 months. In brackets, I’ve included the traffic for the last 3 months. Now, let me talk to you about some of these numbers in greater detail. Check out the screenshot below. As you can see from the above image, overall traffic has been increasing very steadily. You can see the dip I was talking about in late December and early January. I also took a little while to get back into the swing of blogging just after the Christmas period. My motivation for writing was a bit low. If you look at the screenshot above, you can see that organic traffic dominated my top sources. Remember what I said earlier, I don’t pay a great deal of attention to SEO anymore. I rarely optimize my posts for search engines, and the outcome hasn’t been bad at all, has it? It just goes to show that you don’t really need to do much to get your content ranked. As long as your blog posts are well written, useful, compelling, valuable, then that’s all that really matters. In the above image, you will see that Facebook was the 3rd largest traffic provider to my blog. OK, so, finally, finally, finally… Below is a list of the income streams that I’ve been able to create through Magnet4Blogging in the first year. Most of the passive income you will see came from my online product and services reviews. Disclaimer: This income report may contain affiliate links. If you click on any of these links and make a purchase of a product or service, I will be paid a small commission, but, at no additional charge to you. It literally doesn’t cost you anymore to use my links, however, you’re not obliged to use them. If you do use them, I’d like to thank you for your support, I appreciate you. I also want you to know that I would never use or even recommend products or services that I don’t 100% trust. In brackets is the income generated in the last 3 months or Quarter 1 of 2015. Before I share my huge list of expenses, I just want to say a few words about the income report above. This earnings report is far from impressive, I realize that. I also know that there are probably many 1-year old blogs out there doing a lot better than this. However, I’m happy with my progress so far. I’m in absolutely no rush to get to the level I would like to be because I’m enjoying the process so much. My biggest driver for affiliate revenue as of this moment is Thrive Themes. I do hope this trend will continue to grow with more Thrive promotions, tutorials, and reviews in the future. OK, so let’s now get to the expense report… Gulp! Once again, expenses for the last 3 months or Quarter 1 are placed in brackets. In addition to the above expenses, I’ve also invested some of my own money into this blogging business. I spent a great deal of money on hardware and software upgrades, and various other productivity tools. Here’s the list below. Right then, as I said, I’m very happy with the progress I’ve made so far with this blog, and the investments that I made in the last 12 months was much needed. I will continue to invest more money into building my blogging business in the next 12 months, of course. In addition, there are some website building and WordPress development tools I would like to invest in, in the near future. So there you have it, a detailed breakdown of both income and traffic, as well as the progress I’ve been able to make with my blog in the first 12 months of its life. I hope you’ve enjoyed reading through this report. If you’re just starting out yourself, I hope you’ve found my report somewhat inspiring and motivating. I know it’s not easy building an online business through blogging, heck I failed the first time around. All I can say to you is, just keep going and don’t give up. Before I sign off on this post, I want to mention a few names of some of the bloggers that have both influenced and inspired me in the last 12 months. Adrienne Smith, a great friend, passionate blogger, and queen of blogging engagement. Sadly, Adrienne no longer blogs, sadly. Ryan Biddulph, a great friend, storyteller and living proof of how successful blogging can fund a life of traveling and good times. Sylviane Nuccio, recently connected but already have gotten a lot of value from reading her blog. Enstine Muki for featuring me on his blog. Don Purdom, for mentioning several of my blog posts on his blog over the last 12 months. Don’s book The Shift is amazing and a must-read for businesses new to the web. 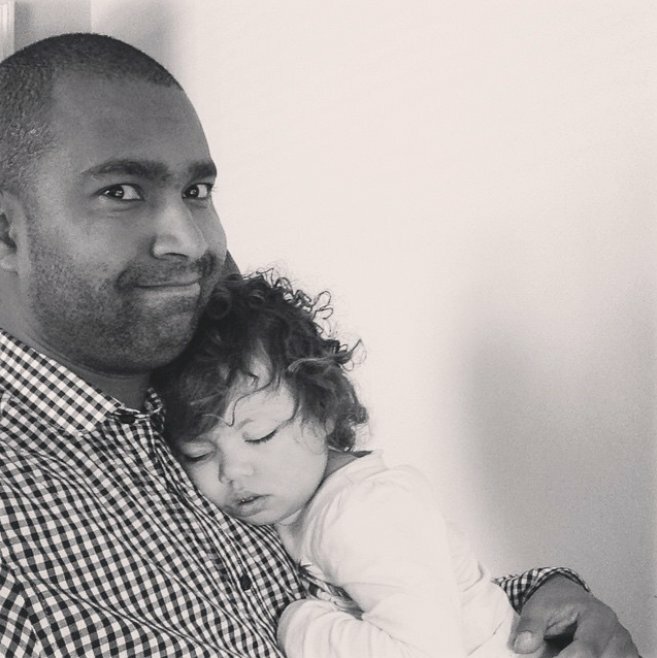 Maxwell Ivey, aka ‘the blind blogger’, for showing the blogging and entrepreneurial world what can be achieved with incredible passion and determination, regardless of the obstacles that life throws at you. Sue Anne who writes at Successful Blogging and who also mentioned me in an experts roundup post, truly appreciated. Until next time peeps, happy blogging, keep working hard and stay safe. I love seeing hard working people who care and are overcoming the odds like yourself succeed!!!! You are a true testament and I’m so excited for you!!!! Your growth in the last year is phenomenal and your audience is growing and your community is rallying to your side. Indeed, I’m looking forward to the journey with you! It is indeed very inspiring to read your journey. Also it feels great when you see people who are dedicated and focuses, succeeding. Your latest blog design is nice. More so because of the fact that it looks organized. Keep up the good work. Hey R Kumar, how are you? So happy that my progress report was inspiring for you, glad you love my current blog design, I love it too and it’s take a long while to get right, but I got there in the end. Congrats on how far you have come. It’s only gonna get better from here! You are doing a great work although not profitable. I think there hardly few people who can plan for future and for that sacrifice few loses in recent times. Your 1 year achievement is a real boost for a newbie blogger like me. Learning many things from your blog about How to become a smart blog. Hi Manidipa, thanks for taking the time to visit and commenting, thanks for your kind word. No it has not been a profitable year at all since I spent a lot of money and reinvested in tools etc. I’m going to work hard to try and make the second year a lot more profitable. So glad I’m able to help you become a smarter blogger, and if there’s anything I can help you with specifically, please don’t hesitate to get in touch with my Manidipa, have a great rest of the week! Hi, Fabrizio, congratulations on coming so far! I’m impressed most by your plans for the next quarter – you’ve inspired me to do a lot more. Don’t be so hung up about your expenses, we’ve all got them. I don’t know how other bloggers present this information but (as you may know) the way you’ve listed your investments is not how you calculate profit. This may seem a little technical (depending on your accounting knowledge) but when you buy a piece of hardware such as a laptop that you plan to use for let’s say 3 years you only charge a third of the cost to each year. So your deductions for the last year should be nowhere near as high as you’ve listed and you’re definitely in profit. Well I have to say way to go actually. Most people come online and never make a dime so this is proof that this can work and I have a feeling that whatever you have up your sleeve that you’ve been thinking about to make more passive income will definitely work to your advantage. You’re just a go getter my friend. Thank you for the mention, I’m truly touched. Nice surprise actually and I really appreciate it. I didn’t realize you had two young ones, I knew you had the one. You must be a busy guy. I applaud you for wanting to be there for the kids and I admire you for taking that one. That shows true love my friend. Great post and I have a feeling those numbers will get better and better as time goes by. You just keep up the great work and I love your blog and the look. I say you’ve hit a homerun with this one. Have a great end to your week my friend. Hi Adrienne, thanks so much for your very kinds and very uplifting words. I hope this report will inspire many new comers, and like you and I know very well, it’s darn well hard building a business through blogging to make any kind of living. I just want to keep sharing whats working for me and help others achieve success too with their blogs. Yeah I have two little ones, a boy and a girl so the best of both worlds, and boy do they know how to make sure daddy is feeling well drained by the time he sits down to get work done. Sleep, good diet and exercise keeps me motivated though. Nice blog you have here! I stumbled upon your blog while searching for potential new networks. I found your blog and thought “hey, this isn’t just another blogging blog”. This is one of the few legitimate blogs that I’ve found since 2 years ago – a lot of blogs nowadays are just regurgitating content from other sites. I’ve been a blogger myself for the past 3 years, but I never did find an “identity”, but I’m slowly but surely getting my mojo on. Hope you can take a look at my blog too hope we can work something out in the future! PS: Your blog looks amazing! I think the term is “3rd time the charm”. Got my comment through this time, not the internet connection, not the power outage could stop me from posting my comment this time. You have done and are doing a wonderful job Fabrizio. Hats off. You are rocking it. You are AWESOME. Your contribution to the blogging community is both appreciated and valued. And your results are the outcome of your efforts. I’m both Impressed and happy for you. Hey mate, thanks so much for stopping by and glad you were able to get that comment through in the end. Thanks for your encouraging words, that really means a lot, now let’s both make the next 12 months the best one ever for our blogs. Congratulations on your first year success with Magnet4Blogging – you should be proud of your achievements. You can really see your overall trends increasing and that has to be a positive sign. Keep up the good work with your excellent content and here’s to Year 2!! David thanks mate, so great to hear positive and encouraging comments. I hope to share many great things and open up new opportunities for my community in very near future. The numbers are small, but it’s a start and I’m positive for the next year. But now, I try to do my best for my blog, and I also get a lot of friends because blog walking. Honestly, I am also quite proud of my accomplishments at this time. Thank you for this post, Fabrizio. Nanda thanks for stopping by and checking out my progress report and a warm welcome to my blog. Awesome to connect with you, loved the Gifographic you shared on your blog the other day by the way. Thanks for sharing your accomplishments with us, it’s good to recognise them and shout about them, it’s even better to feel proud as it only spurs you to do even better! Hey Jerry, thanks so much for your feedback. I’m really pleased you like the design as with so many of my readers who are telling me this 🙂 Hope to see you here again soon buddy. You can be very proud. You’ve achieved a lot since you started, and having dedication to a family is most important which makes juggling everything a challenge, I’m sure. Yeah, sometimes expenses are more than the income in the beginning, especially if annual fees kick in for some services, etc. It will level out. You’re a hard-working and big-hearted guy, with a lot of talent, and I only see growth in your future. Well done, Fabrizio! Very happy for you! Does Thrive used a framework like Genesis? 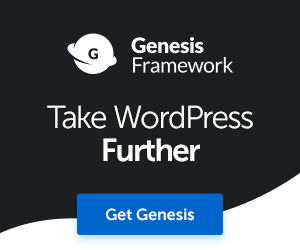 When it comes to updating and site security isn’t it better to have a Parent and child theme like Genesis and StudioPress? No Thrive doesn’t use a Framework like Genesis. It might be better as a security precaution to use a child theme like Genesis. But I think if someone is going to hack into your site, then they’re going to do it regardless whether you have a child and parent theme or not. There are many things you can do to prevent that of course, but no theme is truly 100% safe from harm. This report is over a year old now since then I’ve gone back to Genesis, one of the many reasons being security, but moreover, I think Genesis child theme have a more professional finish to them.